This was very delicious and enjoyed by all my family. My son asked for potatoes and peppers to be added next time I make it.I normally make a Tikka Masala which asks for the chicken to be marinaded for 24 hours and the sauce cooks for about 1 1/2 hours. This recipe was fairly close to that one with a lot less effort. This is so delicious! Thank you for posting. I don’t have an Indian restaurant anywhere near me, so this not only satisfies my craving, it also is far lighter than the original dish. 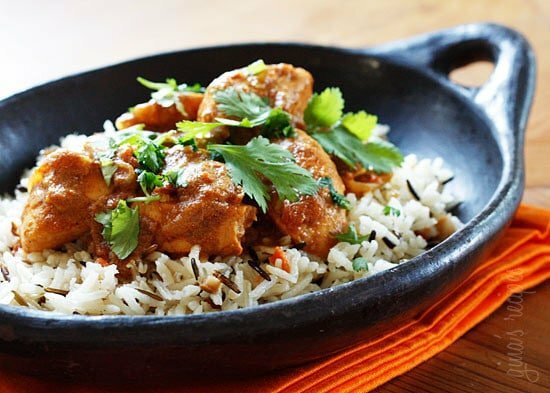 Chicken Tikka Masala is one of my favorite Indian dishes but with being on Weight Watcher it is hard to fit this high-calorie dish into my meals. I made this yesterday and it is delicious! I don’t feel denied and don’t have to waste points on the higher calorie and fat take out version. 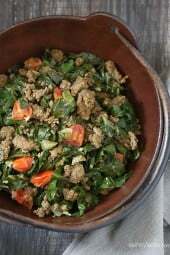 I served it over cauliflower rice and it was amazing! So flavorful! I didn’t have crushed tomatoes, but I had some roman tomatoes that were on their way out. So, I chopped, saute, cooled and pureed them. Added some raisins…and frozen peas and dinner was set. My wife and I really enjoyed it. It was perfect for a Thursday evening! I made this recipe for dinner tonight. It was amazing. I used the 2 ingredient bagel recipe and made Naan. So good. Is the chili powder in this recipe cayenne or the Mexican-ish stuff you buy labeled as chili powder? Thx! Could you also do this in a crockpot/instant pot? In the Nutrition Information section, there is no number for sat. fat and cholesterol. Are these numbers available? Hi, do you add the chicken raw? Very yummy — loved the flavors, though I thought there was too much sauce compared to chicken. Next time I will add a bit more chicken, I think. My girlfriend and I made this recipe for dinner to try something new and it was AMAZING. We put it over couscous , which was OK, but the tikka masala was flavorful and not too hot. We did not use the cilantro and followed the recipe otherwise. We will be making this again! I just made this, leaving out the turmeric based on other comments. I also only used 1/2 the Greek yogurt as I find it can make sauces sour, and fat free half and half instead of 1% (same points value!) It came out delicious, though I agree with an older comment that said the spices are a little gritty. Next time I’ll purée the sauce before adding the chicken. I have never been disappointed with a recipe from Skinnytaste! This one was awesome as well – I took an idea from the Instant Pot Tikka recipe by adding cauliflower and peas. Delish. i LOVE this recipe! 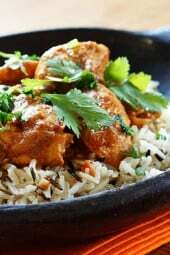 Me and my husband are avid fans of Tikki Masala (he can eat it almost every day) but I have a hard time eating it because its so heavy. 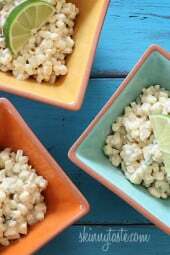 I tried this recipe last night and we loved it! 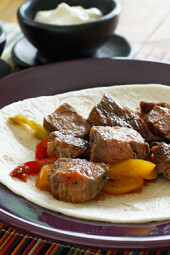 it is so flavorful and delicious and surprisingly light. He even said he likes it just as much as the Tikki we order out! I will definitely be making this again, thank you Skinny Taste! will Greek yogurt mess up the consistency or flavor? Nope, just make sure it’s unflavored. Is it whole cumin or ground cumin? Excellent. A healthy Tikka masala that you can make a lot of and eat throughout the week. Pair with some basmati rice and naan. I skipped the cilantro since it’s basically just a garnish. This came out great! Not spicy at all and full of flavor. I ended up using half and half instead of the 1% milk and it added an extra smart point but it was worth it. I also added a half cup of frozen peas near the end for color. Would cashew milk work in this recipe? I loved this! I served it over rice as pictured. Sooo yummy! I made it with boneless chicken thighs because that is just what I had on hand that day. My husband (who used to not venture out at all) went back for seconds. I LOVE to eat good food as a weight watcher and will never be a grilled chicken breast/broccoli sort of gal. I am SO thankful for skinnytaste. This recipe falls right in line to what I’m used to from skinnytaste…. healthful, real ingredients, flavorful, and lots of variety! I will make this again and again. Made this! We are so picky but this was AMAZING!!! Loved it! Definitely will make again! You absolutely crushed it with this recipe! I’ve had this dish in India as well as homemade and in Indian restaurants here in the US; I must admit I didn’t think it was possible to make a healthier version of chicken tikka that’s every bit as flavorful and satisfying as the original, but you hit it out of the park! If you can part ways with the thickness normally provided by heavy cream, then this version will not disappoint. I’ll be making it again and again. Also for those who don’t tolerate spice too well, you might want to decrease the chili powder. Good to know the sauce freezes well! Hi! Could this also be made in the slow cooker? What would those instructions be? Hi! Have you made this using chicken thigh? I have a ton to use. Thanks! Can you use coconut milk to make it dairy free? I’ve been making this recipe for years and love it. This week we have a ton of leafy greens in our CSA box to get through, so I added some rainbow chard to the recipe and it was an amazing addition! The sauce freezes beautifully! I make a quadruple batch (no chicken) and freeze in quart-sized mason jars for busy nights.